Good Morning!! Today is the first day of the My Craft Spot release party!! I am so excited to get to share with you a project that I created with the new Candy Corn Kisses stamp set that is debuting on the My Craft Spot blog today. 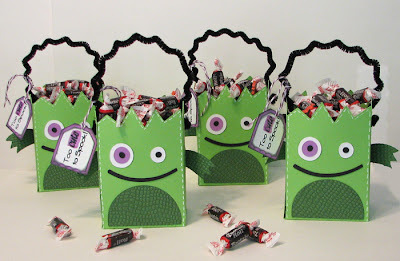 I used my Cricut and the Mini Monsters cart to cut out these really cute monster bags and then filled them with Tootsie Rolls. I embossed the bellies and arms with the Tiny Bubbles embossing folder in my Cuttlebug. I then added some handles with some black chenille stems and some white pen stitching detail (hint: draw the stitches before you put the bag together......I didn't and it was kind of hard to do afterwards). Hop on over to the My Craft Spot blog to see what the other designers have done with this new stamp set and be sure to leave a comment over there to win a prize. She will be giving prizes away each day this week!! 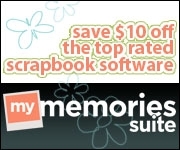 Don't forget to add the Release Party button to your blog so that you can get an extra entry each day. 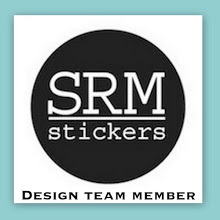 I will have another project to share with you on Wednesday and then there will be a fun blog hop with the My Craft Spot design team and you will have a chance win a set from the new releases.....so, check back!! Your treat boxes are too cute!! I love the chenille handles! WOW Amy! How cute are these!! They are the most adorable little monsters I've seen! The embossing on the bellies looks great and I love the handles! The sentiment is perfect for them! I am totally making these cute boxes!! I love the color combo of purple and green. The handles are a perfect touch! Love it!! Wow, adorable treat boxes! TFS! Amy, these lil boxes really are too cute to spook!! Love that cute lil face and the chenille handles is a great idea!! Adorable. I can't believe it's almost that time of year again. 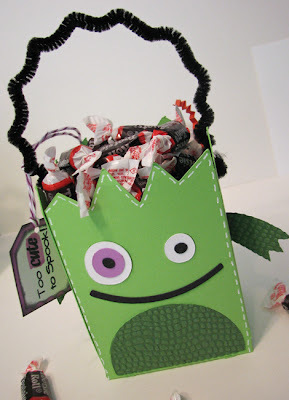 Mini Monsters is one of my favorite cartridges so I just love these adorable little treat bags! Great job! Everything about those is adorable! Amy, these are simply adorable!! Perfect for Halloween! These are SO CUTE! I love the stitching line and chenille stem handles! And the grape colored twine is so cool! 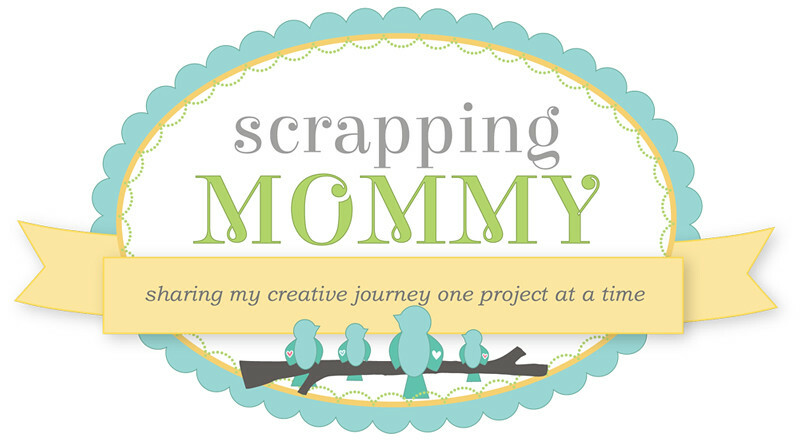 Hi Amy, Your projects are super cute! TFS! OMG! Love your little monsters...now I want candy and I need to lose weight! Shame on you! LOL! Great job on show cases the new stamp set! TFS! 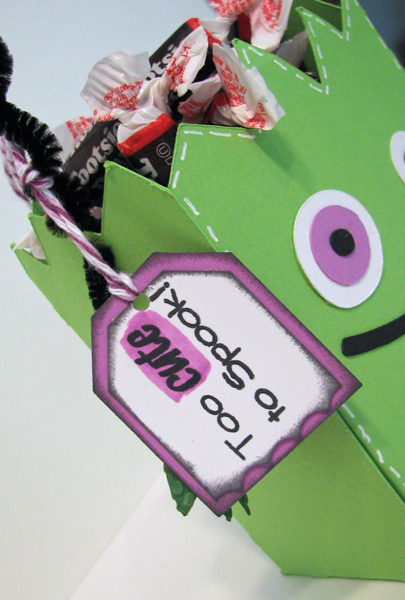 These treat boxes are too, too cute! Your bags are just so cute!!! These are really cute!! Thanks for sharing! These are so very fun!! I know whoever is receiving them will be thrilled!! Your monster treat bags are adorable! Love the tag and the sentiment is perfect:) TFS! These are adorable!! The embossing is such a great touch. I love the way you coloured the sentiment too. Great job!